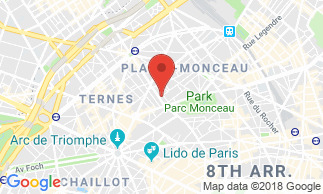 Located 5 minutes from the Parc Monceau, the hotel Courcelles Médéric welcomes you in a refined setting for a pleasant stay in central Paris. Set in a quiet street of the 17th arrondissement, this hotel, completely renovated in 2019, invites you to enjoy a comfortable and restful stay in the heart of the City of Light. For your stay in the capital, the Hotel Courcelles Médéric offers 28 spacious, comfortable and quiet rooms, completely renovated in 2019. They offer facilities to meet your every need: satellite TV with international channels and radio, telephone, free WiFi, alarm clock and desk. The private bathroom has a shower or bathtub, basin and hairdryer. The rooms on upper floors are easily accessible thanks to the elevator. On the ground floor we have a suite available for guests with reduced mobility. - The superior double rooms are very spacious and have a double bed. - The suites are ideal for three or four people. They can be furnished, depending on your choice, with two double beds or one double and two single beds. In addition to its cosy and comfortable rooms, the Mederic Hotel offers a whole range of services to make your stay enjoyable. Enjoy the benefits of 24 hour reception, where we can make reservations for you for restaurants, shows or museums. You will also enjoy our breakfast service and drinks on request. There is an internet point too. Next to the reception, you can relax in our pleasant lounge, drink a cup of coffee or plan your day. Newspapers are provided, along with many brochures offering a range of cultural activities. For guests with reduced mobility we have a fully adapted room and there is an appropriate parking space close to the hotel entrance. At the heart of the Plaine Monceau, a very peaceful area in the 17th arrondissement, the Hotel Courcelles Mederic offers a remarkable environment scattered with little restaurants and markets. A few minutes on foot bring you to the famous Parc Monceau, the Champs-Élysées and the Arc de Triomphe. Similarly, only a few minutes away by bus or metro are Montmartre and the Sacré-Cœur Basilica, the Opera Garnier, the Louvre and the 'Grands Magasins' department stores. Breakfast is not included in the room rate : 10 EUR per person. On the menu: coffee, teas and hot chocolate, French baguette, Président butter, traditionally-made jams, croissants, orange juice, apple compote, cheese... It is served in the breakfast room from 7:30 am - 11:00 am, or in your room from 8:00 am - 11:00 am (without extra charge).